Though the highly concentrated stores of ecological energy, such as in wood, rivers and fossil fuels, are easier to remove and transport, these energy sources rest upon the peak of an immense energy sun-burg as we saw in the previous chapter. Fortunately, there is far more direct solar energy available than all other renewable energy sources combined. This is nearly a necessary fact, since, besides geothermal, it is the sun that powers the wind, trees and rivers, and so there must be more energy at the solar source than in the things it powers. The world currently consumes roughly 15 terrawatts of energy, yet there are 174 petawatts of solar energy available (174 000 terrawatts), relatively easy to capture as we shall see. 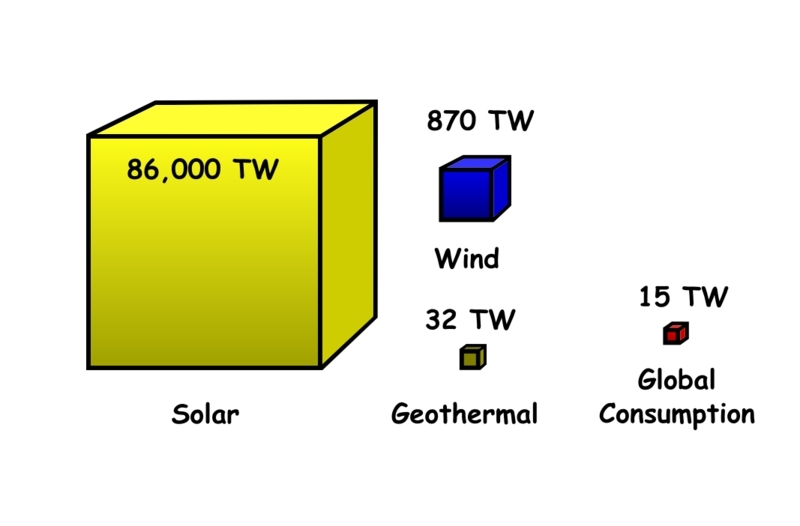 Whereas there is only 870 terrawatts of estimated wind potential energy we could ever capture, 32 terrawatts of potential geothermal, and 15 terrawatts of hydro power, which is to say nothing of the ecological cost of extracting these energy’s (See image below, from wikipedia ). The obstacle is that, the 174 petawatts of direct solar energy hitting the earth is, at any given moment, diffused over half the planet and not directly available in a highly concentrated, conveniently stored form, such as a tree or oil; natural sunlight can dry fruit and clothes but is not concentrated enough to power many of our energy intensive tasks, such as boiling water, roasting produce, making pottery, baking bricks and ceramics, melting metal, and making paper. Fortunately, there’s nothing stopping us from simply concentrating solar energy directly ourselves. Solar concentrators only require a reflective surface, in a relatively simple geometry, supported by a relatively simple structure that can move to track the sun. The materials, tools, and knowledge to create all three are widely available. Thus, to massively develop solar concentration, there’s no need for any theoretical break through, nor rare materials, nor would a bottleneck be formed by the reliance on a limited material or skill, nor would we find the energy source is useful in only a minority of situations, (or that there is relatively little net energy. To build a relatively powerful solar concentrator, the basic materials are extremely common, and for each material component there are dozens of possible substitutes – many can be be easily recycled from (soon to be defunct) infrastructures – and the knowledge, skills and tools are widely available. But to be sure we must study a few questions mentioned in the last chapter: 1) that the energy required to make a solar concentrator is far less than the energy such a solar concentrator will provide (a high positive net energy), 2) show that solar concentrators can be built all over the planet in sufficient numbers in a reasonable amount of time (that the practice is scalable before the ecosystems start to collapse), 3) show that if global society was based on solar concentration we won’t destroy the planet (there is not high direct or collateral ecological damage that risks overwhelming the ecosystems). Why is it not already done then? Seen the incredible abundance of solar energy and that we are capable of concentrating it to essentially any temperature and power we currently use, a natural question is why isn’t solar concentration already widely developed and used? The reason is that though naturally concentrated solar derivatives, such as trees, rivers and oil, are in far more limited supply, the high quality supplies that do exist are easy to access, extract and store. So, as long as high quality stores existed and the environmental consequences could be ignored, it is more convenient to chop down a tree or pipe fossil fuels around than to concentrate the sun’s energy ourselves. In short, for naturally concentrated solar derivatives, nature has already done the work of concentrating the energy, saving us the trouble. However, now it is clear nature concentrates these energies for her own purposes. All actions require energy, and so the first condition any energy system must fulfil is that it provides more energy than it takes to build and maintain. For example, if it took more energy for your organism to digest food than energy you obtain from food, you will necessarily starve no matter how much food you eat. Clearly, the energy it takes you to digest food must be a smaller percentage than what your body absorbs from it. The same must apply to any external energy system society may build, and the higher the net energy the more energy can be used to do things other than simply repair and replace the device in question. There is a fair amount of controversy on how exactly to calculate net energy, whether and how to include the energy used for the workers to live as well as how much to include of the energy required to maintain all the associated infrastructure required to build the device, but we will skip over these details because solar concentration has a very high net energy and requires very little infrastructure to build, so compared to a technology that has far lower net energy and far higher dependence on complex infrastructures (large windmills, photo-voltaic, nuclear reactors), regardless of the exact figures employed, we can be sure that such a solar concentrator has a far higher net energy. To build a solar concentrator we need some mirrors, usually made with a metal, such as aluminium (the third most abundant element on earth), bonded to glass. The energy it takes to make a square meter of mirror can be supplied by a square meter of solar concentration in a few weeks. The structure of a solar concentrator can be made with bamboo or wood, which requires a few weeks of sunlight to grow on a square meter. Metal can be used for the structure, which will increase the energy pay-back time, but will provide a structure that could exist for hundreds of years if maintained. Some small metal pieces may also be required for a bamboo or wood structure, but the energy needed is small. To hold the mirrors in place resin and fibre can be used which can be grown in a few weeks on a square meter of land. Though the times noted may change from region to region or material to material, at most it should only be about six months for a solar concentrator to pay for itself in an energy sense. The mirror will be the most energy intensive thing to replace, and usually lasts 30 years. So even if the entire machine is replaced after 30 years, this gives a net energy of about 30 to 60. What is as important, aluminium, steal, and glass can all be smelted or recycled using solar concentration, and so the technology can proliferate itself (and so does not rely on another low net energy, or non-renewable energy to be build and/or maintained). Furthermore, a basic solar concentrator can be built on location with a minimum of transportation. Raw materials may need to be transported, but there is no complex global production line required. Though the actual global fossil-fuels economy can create a lot of relatively small objects, even complex ones, in a relatively small amount of time, replacing the infrastructure that allow this global fossil-fuels economy to exist takes far longer. This infrastructure cannot simply be "produced". For this reason it is difficult to scale a highly technical energy solution as it requires fundamental changes to the global infrastructure (as the infrastructure itself would also have to run with the new energy system, which may not be a simple task). Though these changes aren’t impossible, it is unlikely they can be made before declining oil production sends the global economy into chaos, which seems to already be occurring. Simple solar techniques on the other hand can be implemented globally in a very small amount of time without any central planning or immense structural and energy intensive undertakings. Fire and tilling are two examples of techniques that once invented had spread very quickly over nearly the entire planet. So, the closer we are to a technique that can be spread exponentially through every community, the faster the technique can be scaled. Since solar concentration is intrinsically local, depending on the sun’s free rays and not some vast complicated system, it has the potential to spread like the fire. However, a few conditions must be satisfied: techniques must be refined enough to be easily transmitted and built anywhere, and powerful enough to be obviously beneficial. This book attempts to show these conditions are attainable. As we saw in the previous chapter solar energy is intrinsically less ecologically destructive than natural derivatives of solar energy, such as bio-mass and river power. We can also note that building solar concentrators does not necessitate deadly toxins, nor require reforming land masses and ecological structures, nor does waste built up indefinitely. Indeed, everything in a solar concentrator can be recycled into new solar concentrators, or biodegrade. For all these reasons solar concentration has the potential to lower a persons ecological impact below anything that has existed since the discovery of fire. Though making fire is a common quotidian experience for nearly all humans for the last 200 000 years, it is in fact a very ecological destructive source of energy, due to ecological energy amplification and ecological collateral damage, discussed in the previous chapter. For direct solar energy, however, since the space occupied by even a large solar concentrator is nearly insignificant, compared to the population density of essentially any region, and furthermore no vast transportation infrastructure is required to make use of a solar concentrator, as it works on location, it is possible to lower our ecological impact of close to only our food system (addressed in the second part of this volume), yet still with the energy access to boil, cook and bake things. With solar concentration we are no longer tempted to cut down our fruit trees to burn them. One of the most important factors in developing solar concentration is that the solar fuel is essentially free. Free-fuel means that activities can be created where there was no such activity before, and that we can completely break the assumption that we must replace activities as they currently exist in the globalized economy. New solar economies could be spontaneously built in places all over the world and spread; i.e. no vast centralized plan or inter-national agreement is necessary to develop solar concentration. As important, a society based on direct solar energy would be agreeable to live in, solving many existing social problems. Currently, employment in the modern economy is essentially equivalent to the consumption of fossil-fuels, since fossil fuels are in limited supply, employment too must be in limited supply. When fuel is free however, using solar energy in one location does not diminish someone else’s access to solar energy elsewhere, in any significant way. Though the modern economist likes to define poverty in terms of dollars, real poverty is defined in terms of energy, and it is only because dollars are required to access energy in the modern economy that the modern economist is able to ignore reality. Since solar-fuel is free however it is possible for everyone to access the energy required to boil water, cook, heat their home, and start any new activity that would benefit the community. Furthermore, the very nature of solar energy is that it cannot be dominated by a few companies or countries; since solar concentrators need to be built, maintained and operated by people, a direct solar energy society is not a strange undesirable vision of society where most people are essentially useless, living in large boxes and towers, provided "inputs" through a mechanized system of tubes and box displacement. Since decentralization is necessary to utilize solar energy effectively, in a solar society people would live close to nature with a fair amount of space, in communities compatible with the human psychology. Access to water, energy, and land would thus be a real birthright of every person. However, though solar-fuel is essentially free, so the above economic benefits are only possible once solar concentration are widely understood and in use. Individuals, NGO’s, and universities and other organisms can greatly speed this process by building solar centres for demonstration and development where anyone can learn to build a solar concentrator. In such a centre people would be able to see the various techniques and applications that exist and so be able to choose and adapt what is best suited to their situation and needs. Solar concentration artisans and technicians could be trained and new uses invented. We can thus start to imagine a society where people reappropriate their source of energy and thus their economy, community and society. As solar energy is accessible everywhere it is a path to political liberty, the right to self-determination of a community, in the most profound sense. All the above factors mean that solar concentration is resilient. Solar concentrators do not need complex interconnected economies to be constructed, and are not interconnected between themselves like the electricity grid. This means that if a solar concentrator stops working in one location, it won’t affect a concentrator somewhere else. Likewise, if one solar concentrator breaks this will not some how break solar concentrators elsewhere. This is fundamentally a different situation than any electricity grid, where complex economies are required to build an electric infrastructure, and the entire grid can crash due to a single event. So since local solar concentration does not depend on the complex globalized economy, and can be used to build yet more local solar concentrators, the strategy of building as many concentrators as possible is both feasible and robust, as it can succeed even through severe disruptions to society as we know it. However, for a solar technology to be truly universal, truly local, and truly feasible it has to be designed along the appropriate principles. Though direct solar energy is not simply lying around waiting for us to cut it down or drill into, the advantage of its diffuse nature is that it is not only an energy source but an energy distribution system. What some may see as extra work in having to concentrate this energy ourselves, is more than gained by no longer having to build and maintain as massive and complex energy and transportation infrastructures, diminishing the liquid fuels and electricity problem to a manageable level. However, to take advantage of no longer depending on a massive infrastructure and mega-cities for energy, we must use solar energy as close to the resources we depend on as possible. Our primary resources, air, water and food, and so a reversal of the urban trend must accompany the development of solar concentration to be effective, as we shall see in the next volume. The exact numbers of potential power from solar, wind, and geothermal, are liable to change from model to model. Next Chapter Which Solar Concentrator?